Oil on canvas 28 5/8 x 38 1/8 in. Oil on canvas 25 x 32 in. Form: The brushstrokes are more deliberate and planned than those of the Impressionists, he is not merely trying to be painterly, but to record the 'sensations' of nature. Iconography: This was a mountain near Cezannes home in France, and he painted it over thirty times during his life. According to Stokstad, The even lighting and still atmosphere makes these paintings more enduring when compared to way Impressionists are always trying to capture the 'moment'. 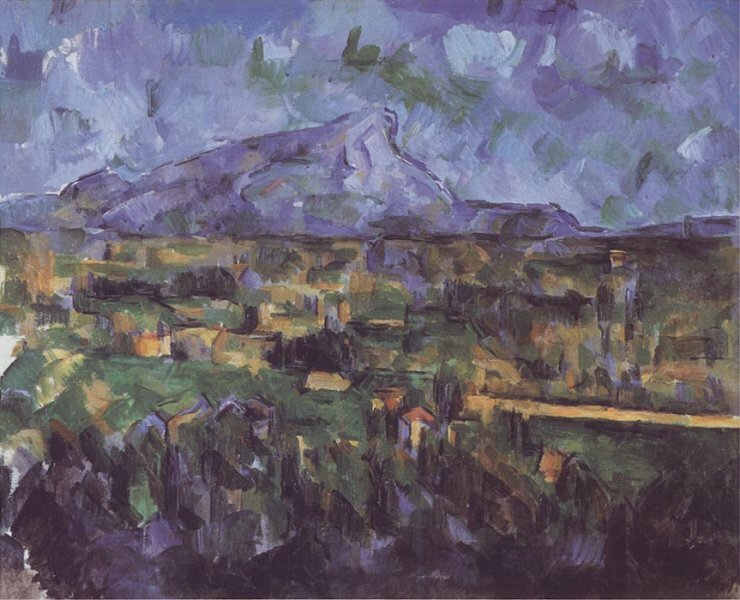 Cezanne wanted to capture a sense of timelessness and solidarity with this impressive landscape. On the top painting, the trees in the foreground help to create the illusion of depth and underscore the immensity of the mountains. Even on the bottom painting, which is much looser and more abstracted, we find the mass of trees in front, and a vast expanse of land stretching back toward the imposing hills. 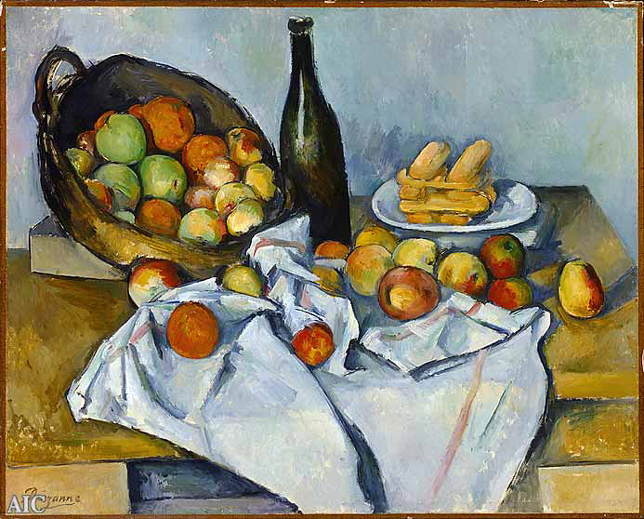 Cezanne has often been called a universal artist, but you cannot grasp his work unless you realize that he was a deeply local one as well. He was not just French but southern Mediterranean French, a Provencal; and the obsessive, enduring, reinforcing sense of the particular landscape of his cultural memory is wound into his work so far as to completely remove it from the domain of pure, unsymbolic form. In a sense it is part of the great movement away from the national toward the local that characterized so much of European, including French, culture in the latter half of the 19th century. 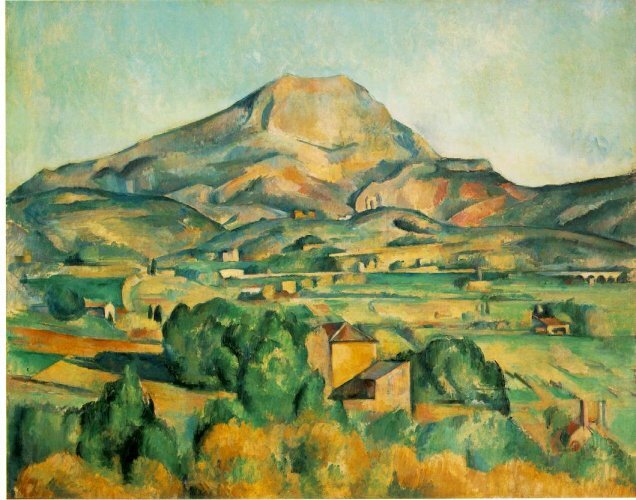 You feel it particularly in Cezanne's series of landscapes of his "sacred mountain," Mont Sainte-Victoire. Now it is a mere shimmer of profile in a watercolor, whose blank paper becomes the white light of the Midi, burning through the pale flecks of color. Elsewhere, in the late oils, it achieves a tremendous faceted density, that crouched lion of rock. In between there are lyrical tributes to it, as in Mont Sainte-Victoire Seen from Bellevue, 1882-85, where it appears almost shyly on the left of a tender, early springtime landscape, all new green, traversed by an aqueduct (sign of the ancient Roman roots of Provence) and crossed by a pale road whose kinks are tied to the branch forms of the pine that rises in the foreground to bisect the canvas. Vincent Van Gogh Van Gogh's work and the details of his biography are so linked to his paintings iconography that it would be almost impossible to discuss Van Gogh without a brief overview of his life. The following is an excerpt from the Encyclopedia Brittanica. Van Gogh, the eldest of six children of a Protestant pastor, was born and reared in a small village in the Brabant region of southern Netherlands. His early years in his father's parsonage were happy, and he loved wandering in the countryside. At 16 he was apprenticed to The Hague branch of the art dealers Goupil and Co., of which his uncle was a partner. Van Gogh's working life can be roughly divided into two periods. The first, from 1873 to 1885, during which he wrestled with temperamental difficulties and sought his true means of self-expression, was a period of repeated apprenticeships, failures, and changes of direction. The second, from 1886 to 1890, was a period of dedication, rapid development, and fulfillment, until it was interrupted by a series of mental crises from 1889 onward. He worked for Goupil in London from 1873 to May 1875 and in Paris from then until April 1876. Daily contact with works of art aroused van Gogh's artistic sensibility, and he soon formed a taste for Rembrandt, Frans Hals, and other Dutch masters, although his preference was for two contemporary French painters, Jean-François Millet and Camille Corot, whose influence was to last throughout his life. Van Gogh disliked art dealing. Moreover, his approach to life darkened when his love was rejected by a London girl in 1874. His burning desire for human affection thwarted, he became and remained increasingly solitary. He became a language teacher and lay preacher in England and, in 1877, worked for a bookseller in Dordrecht. Impelled by a longing to give himself to his fellowmen, he envisaged entering the ministry and took up theology but abandoned this project for short-term training as an evangelist in Brussels in 1878. 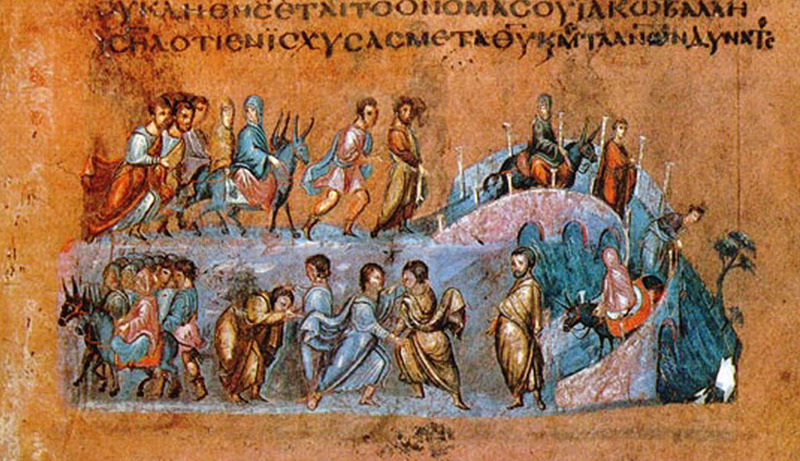 A conflict with authority ensued when he disputed the orthodox doctrinal approach. Failing to get an appointment after three months, he left to do missionary work among the impoverished population of the Borinage, a coal-mining region in southwestern Belgium. There, in the winter of 1879-80, he experienced the first great spiritual crisis of his life. He was sharing the life of the poor completely but in an impassioned moment gave away all his worldly goods and was thereupon dismissed for a too-literal interpretation of Christian teaching. Penniless and with his faith destroyed, he sank into despair, cut himself off from everyone, and began seriously to draw, thereby discovering in 1880 his true vocation. Van Gogh decided that his mission from then on would be to bring consolation to humanity through art, and this realization of his creative powers restored his self-confidence. His artistic career was extremely short, lasting only the 10 years from 1880 to 1890. During the first four years of this period, while acquiring technical proficiency, he confined himself almost entirely to drawings and watercolours. First, he went to study drawing at the Brussels Academy; in 1881 he moved to his father's parsonage at Etten, Neth., and began to work from nature. Van Gogh worked hard and methodically but soon perceived the difficulty of self-training and sought the guidance of more experienced artists. Late in 1881 he settled at The Hague to work with a Dutch landscape painter, Anton Mauve. He visited museums and met with other painters. Van Gogh thus extended his technical knowledge and experimented in the summer of 1882 with oil paint. In 1883 the urge to be "alone with nature" and the peasants took him to Drenthe, a desolate part of northern Netherlands frequented by Mauve and other Dutch artists, where he spent three months before returning home, which was now at Nuenen, another village in the Brabant. He remained at Nuenen during most of 1884 and 1885, and during these years his art grew bolder and more assured. He painted three types of subjects--still life, landscape, and figure--all interrelated by their reference to the peasants' daily life, to the hardships they endured, and to the countryside they cultivated. Émile Zola's Germinal (1885), a novel about the coal-mining region of France, greatly impressed van Gogh, and sociological criticism is implicit in many of his pictures--e.g., "Weavers" and "The Potato Eaters." Eventually he felt too isolated in Nuenen. His understanding of the possibilities of painting was evolving rapidly; from studying Hals he saw that academic finish destroys the freshness of a visual impression, while the works of Paolo Veronese and Eugène Delacroix taught him that colour expresses something by itself. This led to enthusiasm for Peter Paul Rubens and a sudden departure for Antwerp, where the greatest number of Rubens' works could be seen. The revelation of Rubens' simple means, of his direct notation, and of his ability to express a mood by a combination of colours proved decisive. Simultaneously, van Gogh discovered Japanese prints and Impressionist painting. His refusal to follow academic principles led to disputes at the Antwerp academy, where he was enrolled, and after three months he left precipitately in 1886 to join his brother Theo in Paris. There, still concerned with improving his drawing, van Gogh met Henri de Toulouse-Lautrec, Paul Gauguin, and others who were to play historic roles in modern art. They opened his eyes to the latest developments in French painting. At the same time, Theo introduced him to Camille Pissarro, Georges Seurat, and other artists of the group. By this time van Gogh was ready for such revelations, and the changes that his painting underwent in Paris between the spring of 1886 and February 1888 led to the creation of his personal idiom and style of brushwork. His palette at last became colourful, his vision less traditional, and his tonalities lighter, as may be seen in his first paintings of Montmartre. By the summer of 1887 he was painting in pure colours and using a broken brushwork that is at times pointillistic. Finally, van Gogh's Postimpressionist style crystallized by the beginning of 1888 in masterpieces such as "Portrait of Père Tanguy" and "Self-Portrait in Front of an Easel," as well as in some landscapes of the Parisian suburbs. After two years van Gogh was tired of city life, physically exhausted, and longing "to look at nature under a brighter sky." His passion was now for "a full effect of colour." He left Paris in February 1888 for Arles, in the southeast of France. In his pictures of the following 12 months--his first great period--he strove to respect the external, visual aspect of a figure or landscape but found himself unable to suppress his own feelings about the subject. These found expression in emphatic contours and heightened effects of colour. Van Gogh's pictorial style was not calculated, however, but spontaneous and instinctive, for he worked with great speed and intensity, determined to capture an effect or a mood while it possessed him. His Arles subjects include blossoming fruit trees, views of the town and surroundings, self-portraits, portraits of Roulin the postman and other friends, interiors and exteriors of the house, a series of sunflowers, and a "starry night." Van Gogh knew that his approach to painting was individualistic, but he also knew that some tasks are beyond the power of isolated individuals to accomplish. In Paris he had hoped to form a separate Impressionist group with Gauguin, Toulouse-Lautrec, and others whom he supposed to have similar aims. He rented and decorated a house in Arles with the intention of persuading them to join him and found a working community of "Impressionists of the South." Gauguin arrived in October 1888, and for two months they worked together; but, while each influenced the other to some extent, their relations rapidly deteriorated because they had opposing ideas and were temperamentally incompatible. 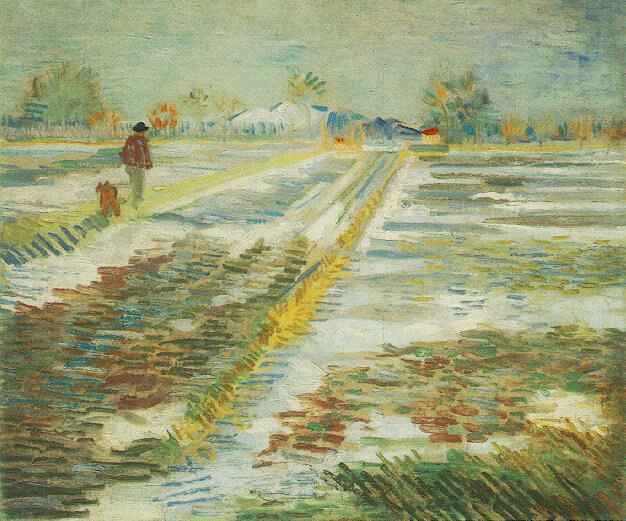 On Christmas Eve 1888, van Gogh broke under the strain and cut off part of his left ear. Gauguin left, and van Gogh was taken to a hospital. 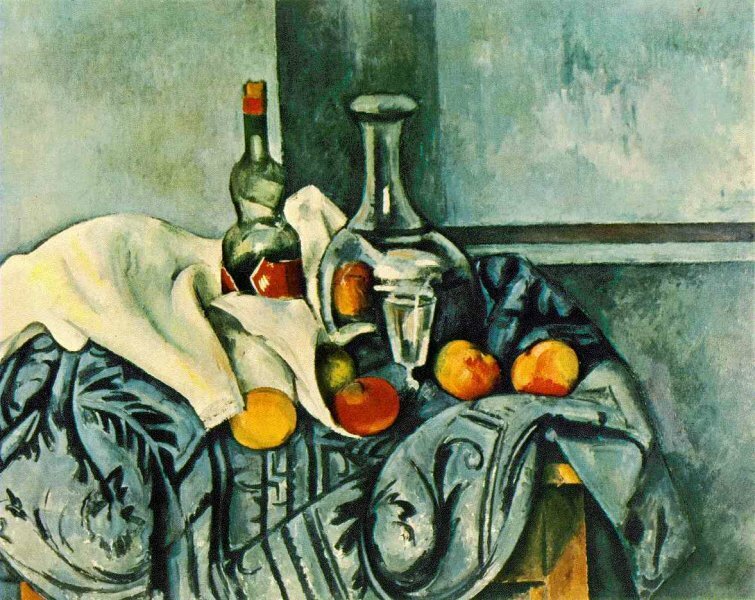 He returned to the "yellow house" a fortnight later and resumed painting, producing a mirror-image "Self-Portrait with Pipe and Bandaged Ear," several still lifes, and "La Berceuse." Several weeks later, he again showed symptoms of mental disturbance severe enough to cause him to be sent back to the hospital. At the end of April 1889, fearful of losing his renewed capacity for work, which he regarded as a guarantee of his sanity, he asked to be temporarily shut up in the asylum at Saint-Rémy-de-Provence in order to be under medical supervision. Van Gogh stayed there for 12 months, haunted by recurrent attacks, alternating between moods of calm and despair, and working intermittently: "Garden of the Asylum," "Cypresses," "Olive Trees," "Les Alpilles," portraits of doctors, and interpretations of paintings by Rembrandt, Delacroix, and Millet all date from this period. The keynote of this phase (1889-90) is fear of losing touch with reality and a certain sadness. Confined for long periods to his cell or the asylum garden, having no choice of subjects, and realizing that his inspiration depended on direct observation, van Gogh fought against having to work from memory. At Saint-Rémy he muted the violent colours of the previous summer and tried to make his painting calmer. As he repressed his excitement, however, he involved himself more imaginatively in the drama of the elements, developing a style based on dynamic forms and a vigorous use of line (line often equated with colour). The best of his Saint-Rémy pictures are thus bolder and more visionary than those of Arles. Van Gogh himself brought this period to an end. Oppressed by homesickness--he painted souvenirs of Holland--and loneliness, he longed to see Theo and the north once more and arrived in Paris in May 1890. Four days later he went to stay with a homeopathic doctor-artist, Paul-Ferdinand Gachet, a friend of Camille Pissarro and Paul Cézanne, at Auvers-sur-Oise. Back in a village community such as he had not known since Nuenen, four years earlier, van Gogh worked at first enthusiastically; and his choice of subjects such as fields of corn, the river valley, peasants' cottages, the church, and the town hall reflects his spiritual relief. A modification of his style follows: the natural forms in his paintings are less contorted, and in the northern light he adopted pale, fresh tonalities. His brushwork is broader and more expressive and his vision of nature more lyrical. Everything in his pictures seems to be moving, living. This phase was short, however, and ended in quarrels with Gachet and feelings of guilt at his inescapable dependence on Theo (now married and with a son) and his inability to succeed. In despair of ever overcoming his loneliness or of being cured, he shot himself and died two days later. Coincidentally, Theo died six months later (Jan. 25, 1891) of chronic nephritis. Form: The texture of this painting is fairly rough because Van Gogh used thick impastos of paint. Van Gogh also used straight umodulated out of the tube colors. The dominant colors here are primary tones. Van Gogh rendered most of the forms using outlines and contour lines and did not rely on value or chiaroscuro to define or describe his subjects. In a way, this is more of a drawing with paint than a painting. The brushstrokes in the sky are designed in sweeping large curvilinearcounterbalancing strokes. Van Gogh's application of short dashes of colour one next to another is a demonstration of impressionist style optical mixing. This is demonstrated especially in how he applied the blues of the sky. The composition is asymmetrical. The large cyprus tree in the foreground dominates the image and its shape is echoed by the church's steeple in the background. Iconography: This was painted while Van Gogh was locked up in an asylum in Saint-Remy, France. It was, of necessity, painted from memory unlike most of the rest of his work, which was painted either outdoors or as a still life. The dominant elements in this painting are the sky, the stars in it, and the cypress tree in the foreground. The fact that the sky is like a sea in motion could be read in any number of ways: as a clue as to the turbulence of Van Gogh's state of mind and or possibly an illustration of the unknown forces that move the universe. The moon seems to radiate energy, but it does not appear friendly, or gentle, as one would imagine moonbeams to be. Instead it imitates the radiating waves one would find when a stone is dropped in a pond, disruptive. The cypress tree in the foreground were often used as gravemarkers and were planted as memorials over graves. In my interpretation, (Mencher's) the large tree in the foreground seems to connect the earth and the sky in a way that the steeple in the background cannot hope to. 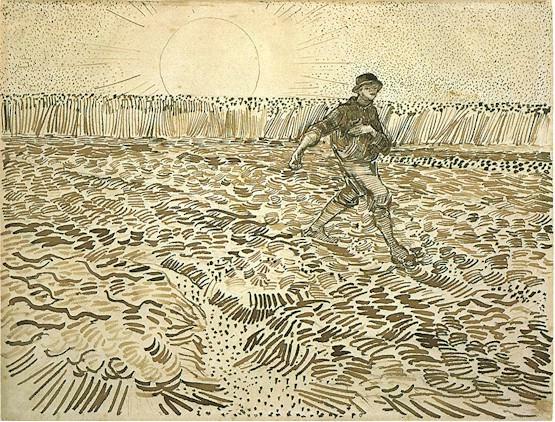 This may possibly be Van Gogh's own ideas of the role of man in the world versus the role of nature in God's plan. This idea being very similar to St. Augustine's ideas concerning the "City of Man and the City of God." This is similar to Masaccio's interpretation in his painting The Tribute Money. Van Gogh Form: The texture of this painting is fairly rough because Van Gogh used thick impastos of paint. Van Gogh also used straight umodulated out of the tube colors. The dominant colors here are primary tones except for the yellow ochres and oranges used for the bedposts. Van Gogh rendered most of the forms using outlines and contour lines and did not rely on value or chiaroscuro to define or describe his subjects. In a way, this is more of a drawing with paint than a painting. The entire image has a rather fisheye lens look to it and the perspective seems a bit off. There are two possible reasons for this. 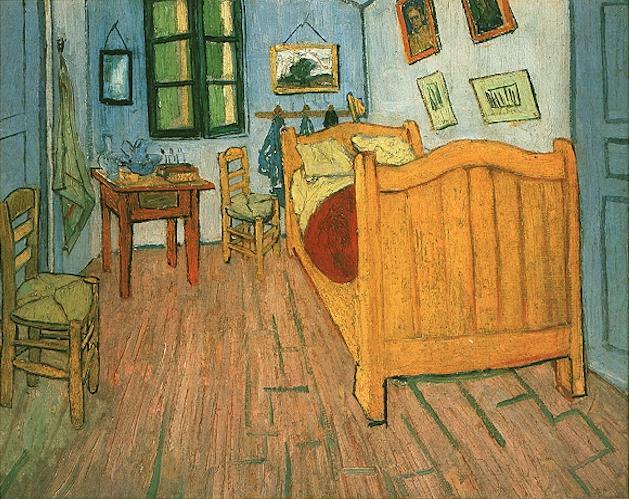 One scholar has explained that Van Gogh's room's walls angles were actually just a touch off. This is actually true because one can actually see the house today, but there are also some other visual discrepancies. Some of the vertical lines in the seem to sway or curve. The pictures lean out just a bit too far and the vertical and horizontal lines are not consistent with the laws of linear perspective. Two other explanations exist. Van Gogh was careless, which at times he was and he may have been forced to sit so close to the canvas that he unconsciously incorporated the distortions that naturally occur when sitting to close to a painting. He was unable to move away from the painting to check the visual problems. 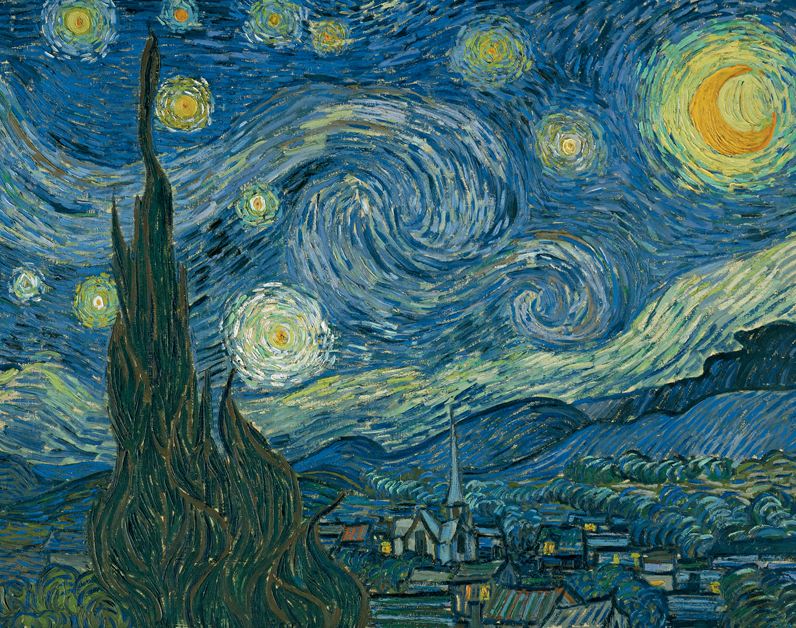 Iconography: As in the "Starry Sky" the formal elements may be an expression of Vincent's internal world. This painting was done in Vincent's own room in Arles. Note the cramped composition, the disproportion of the bed, the saturation of colors, and the odd angle of the paintings hanging over the bed. This, while done from life, does not accurately represent an external reality, it seems to represent his own 'internal' reality. Van Gogh was taken care of by his older brother Theo. As a result, he was allowed a certain amount of self-pity and malaise that other men his age and bearing could not afford to indulge themselves in. Theo sent him to Arles to 'rest', and Van Gogh was in a state of poverty and under-nourishment while living there, as well as hallucinations and acute depression. This resulting painting, nervous and cramped appearing as it is, is an accurate reflection on how he felt at the time, like the walls were pressing in on him, and all he could do was sleep. Like the religious fervor he had embraced earlier in life, Van Gogh became as equally obsessed with painting once he had decided it was his true calling, and felt that he must put on canvas the myriad demons within his own troubled mind.
' My eyes are still tired by then I had a new idea in my head and here is the sketch of it. and chairs is the yellow of fresh butter, the sheets and pillows very light greenish-citron. The coverlet scarlet. The window green. The toilet table orange, the basin blue. The doors lilac. And that is all--there is nothing in this room with its closed shutters. a mirror and a towel and some clothes. The frame--as there is no white in the picture--will be white. This by way of revenge for the enforced rest I was obliged to take. 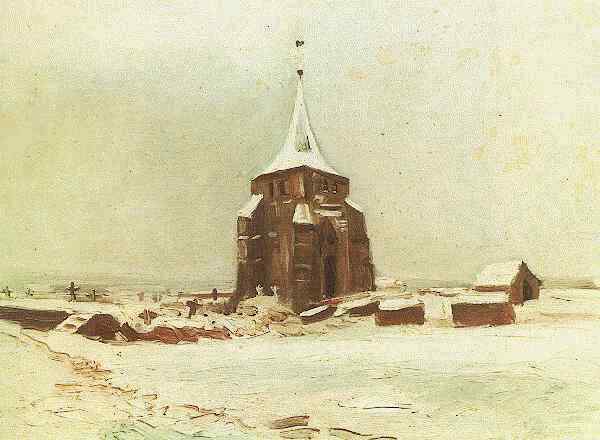 Landscape with snow, 1888 Form and Iconography: The colors used in this earlier work are calm, almost peaceful. Though he is using the short brushstrokes, they are not filled with the tension and anxiety found n his other works. The asymmetrical composition is sweeping, this is a view of an entire field, leading off into the distance. It is said that Van Gogh was happiest when the weather was nice and he could be outdoors painting. Though plagued with mental instability and a string of failed relationships with women of questionable repute, there were occasional breaks in his unhappiness. This painting would clearly be a reflection of his ability to enjoy and observe nature. It also puts to rest the theory that Van Gogh was an untalented artist. As we can see here, when it pleased him to do so, he could paint quite beautifully as well as accurately capture the world he saw around him. Context: Van Gogh was never happy in big cities, and his appreciation for the outdoors is often shown by the time he takes to render his landscapes. Van Gogh Form: Ink was on paper. Looking much like an etching this is done with ink and a paintbrush. The main figure is just off to the side enough to make the work asymmetrical, and it also has a nice gestural and loose feeling to it. Iconography: This image is based on a similar work called the "Sower" by Millet. It is an illustration or representation of the Parable of the Sower as told by Jesus in which he likens the toils of the sower to our own journey through life. "That if one sows a good seed one will reap a good crop." This story and the image that he borrowed from Millet would have had a particularly strong resonance for Van Gogh because he was very religious. As a quick study, this is a good piece of work. Once again, we see the joy that Vincent has while outdoors. 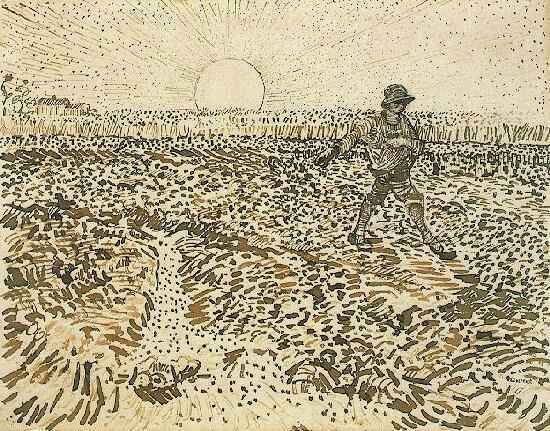 The figure is of a man sowing grain for his harvest, which could indicate the connection between earth and man, symbolizing the connection that Van Gogh himself felt for the earth. In the back, the sun is uncharacteristically huge and round, and its' rays are depicting shining outward from it. This gives it an energy and a sense of happiness it would not have had if the sun were absent from this work. Context: In 1885, while still in the Netherlands, Van Gogh had focused much of his artistic energy doing studies and representations of the poor peasants he encountered. It seems he had an affinity for those who had to work hard to make a living, and he may here be hearkening back to those days. These drawings were actually done after Van Gogh had already made a painting of the same subject. Van Gogh Form: Expressionistic self portrait, done in oils with non-local colors and thick heavy brushwork. 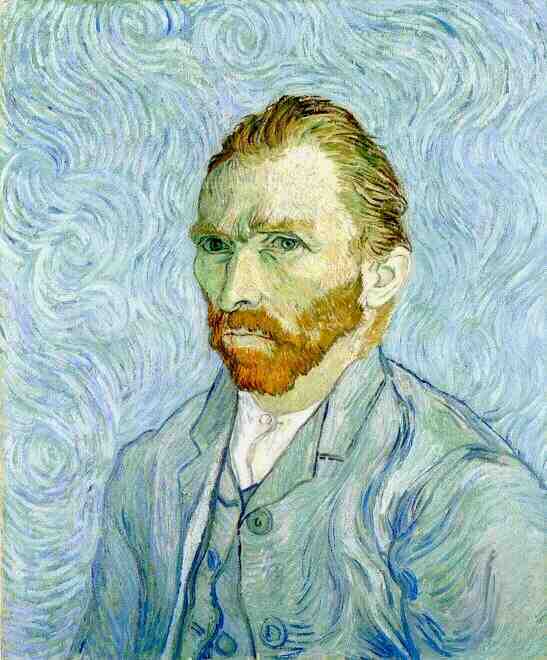 Iconography: This is one of many self portraits done by Van Gogh. It was at this time in his life that he had met and worked with Gauguin in Paris. They had a seemingly temperamental relationship, at first best friends but then having many near violent falling outs. Van Gogh's mental health seemed to worsen during this time, and looking at this painting one can see evidence of his descent into a nervous breakdown. He is swirling the background around his figure, which suggests an anxious energy and tension. He has used sickly greens and yellows in the both the highlights and shadows of his face, and the look he exudes is intense and troubled. If we look at his upper body, it appears as though he is about to hunch his shoulders forward, or move in some way to suggest protecting himself, and his mouth is set in a definite frown. This unhappiness can be attributed to the fact that Vincent was cooped up in a house for the winter with his sometime-friend Gauguin, and his failed friendship and love life was getting too much for him to bear. irrational fit of madness, mutilated the lower portion of his left ear. He severed the lobe with a razor, wrapped it in cloth and then took it to a brothel and presented it to one of the women there. Vincent then staggered back to the Yellow House where he collapsed. He was discovered by the police and hospitalized at the Hôtel-Dieu hospital in Arles. 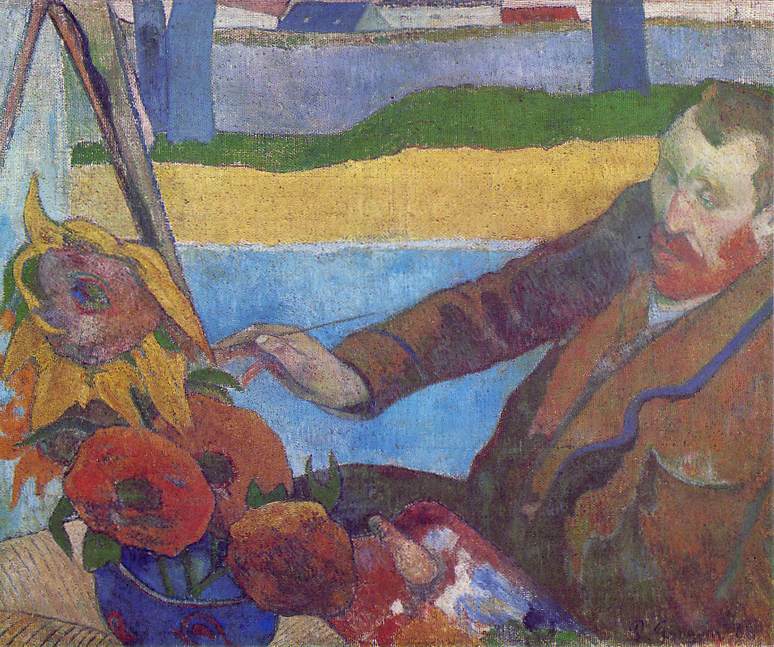 After sending a telegram to Theo, Gauguin left immediately for Paris, choosing not to visit Van Gogh in the hospital. Van Gogh and Gauguin would later correspond from time to time, but would never meet in person again." Van Gogh Form: Early oil painting, symmetrical and well crafted. earthen palette and realistic representation. Iconography: One of the earlier works done by Van Gogh, while living in the Netherlands. He was new to painting, and as such was working very hard to paint accurately and well in order to gain credibility. He has painted this scene of a cemetery probably as he saw it and was working hard to maintain realism. Cemeteries were nothing new to Van Gogh, in fact it is speculated that they may have played a part in his unhappy mental state. Before Vincent was born, his mother had been pregnant with a boy, who was stillborn. His parents named it Vincent and buried it in a graveyard close to their home. His mother became pregnant very soon after and Vincent Van Gogh was born exactly one year to the day the other baby had been stillborn. His mother used to take Van Gogh to the graveyard every year on his birthday to visit the grave. It is speculated that the young Vincent was traumatized by constantly seeing the gravestone with his name and birthdate as the date of death for the unfortunate baby. Context: Whether it is true that it led to his subsequent depression and insanity or not, Van Gogh was still familiar with the setting of a graveyard and did an exquisite job capturing the silence and stillness of this scene. Gauguin was the son of a journalist from Orléans and of a mother who was half French and half Peruvian Creole. After Napoleon III's coup d'état, the Gauguin family moved in 1851 to Lima, and four years later Paul and his mother returned to Orléans. At the age of 17 he went to sea and for six years sailed about the world in freighters or men-of-war. In 1871 he joined the stockbroking firm of Bertin in Paris and in 1873 married a young Danish woman, Mette Sophie Gad. His artistic leanings were first aroused by his guardian, Gustave Arosa, whose collection included pictures by Camille Corot, Eugène Delacroix, and Jean-François Millet, and by a fellow stockbroker, Émile Schuffenecker, with whom he started painting. Gauguin soon started going to a studio to draw from a model and receive artistic instruction. In 1876 his "Landscape at Viroflay" was accepted for the official annual exhibition, the Salon. He developed a taste for Impressionist painting and between 1876 and 1881 assembled an impressive group of paintings by Édouard Manet, Paul Cézanne, Camille Pissarro, Claude Monet, and Johan Barthold Jongkind. Gauguin met Pissarro in 1875-76 and began to work with him, struggling to master the techniques of drawing and painting. In 1880 he was invited to contribute to the fifth Impressionist exhibition, and this invitation was repeated in 1881 and 1882. He spent holidays painting with Pissarro and Cézanne and made visible progress, though his early works are often marred by clumsiness and have drab colouring. Gauguin thus became more and more absorbed by painting, and, in 1883, when the Paris stock exchange crashed and he lost his job, he decided "to paint every day." This was a decision that changed the course of his whole life. He had a wife and four children, but he had no income and no one would buy his paintings. In 1884 Gauguin and his family moved to Copenhagen, where his wife's parents proved unsympathetic, and his marriage broke up. He returned to Paris in 1885, determined to sacrifice everything for his artistic vocation. From then on he lived in penury and discomfort, his health was undermined by hardship, he became an outcast from the society to which he had belonged and could never establish himself in any other, and he came to despise Europe and civilization. Primitive art proceeds from the spirit and makes use of nature. The so-called refined art proceeds from sensuality and serves nature. Nature is the servant of the former and the mistress of the latter. She demeans man's spirit by allowing him to adore her. That is the way by which we have tumbled into the abominable error of naturalism. Break with Impressionism. Gauguin therefore set out to redeem this error by "a reasoned and frank return to the beginning, that is to say to primitive art." A possible method for arriving at a new form of pictorial representation was suggested to him by Émile Bernard, a young artist well acquainted with stained glass, manuscripts, and folk art. He pointed out that in these arts reality was generally depicted in nonimitative terms and that the pictorial image was made up of areas of pure colour separated by heavy black outlines. 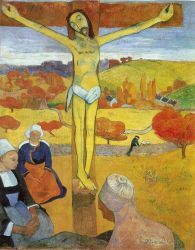 Such was the origin of the style known as Cloisonnism, or Synthetism, which attained its most expressive possibilities in such paintings by Gauguin as "The Vision After the Sermon" , "Bonjour Monsieur Gauguin!," and "The Yellow Christ" (1889). When Gauguin broke with his Impressionistic past, he gave up using lines and colours to fool the eye into accepting the flat painted image as a re-creation of an actual scene and explored instead the capacity of these pictorial means to induce in a spectator a particular feeling. His forms became ideated and his colours suggestive abstractions. 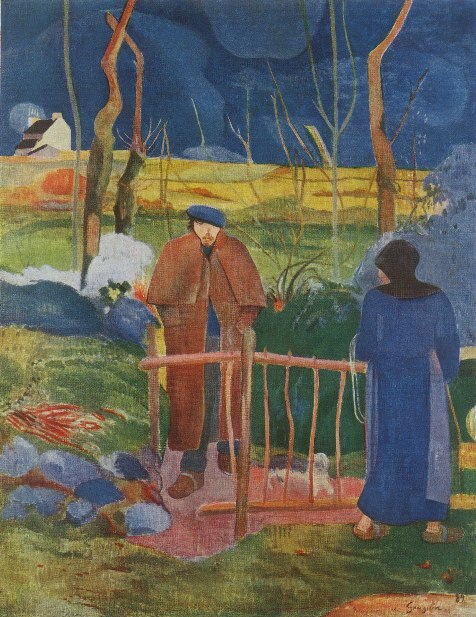 Maurice Denis, in Théories (1920), described a small painting executed by Paul Sérusier under Gauguin's direction in 1888; this landscape seemed to have no form as a result of being synthetically represented in violet, vermilion, Veronese green and other pure colours. . . . "How does that tree appear to you?" Gauguin had asked. "It's green isn't it? All right, do it in green, the finest green on your palette. And that shadow? Isn't it blue? Well then, don't be frightened of making it as blue as possible." Thus [writes Denis] was presented to us for the first time, in a paradoxical but unforgettable manner, the fertile conception of a painting as "a flat surface covered with colours arranged in a certain order." Gauguin indulged in "primitivism" because he could make a more easily intelligible image; his simple colour harmonies intensified this image; and, because he wanted his pictures to be pleasing to the eye, he aimed at a decorative effect. His purpose in all this was to express pictorially an "idea." It was as a result of this that he was acclaimed as a leading painter of the Symbolist movement. Gauguin's whole work is a protest against the soul-destroying materialism of bourgeois civilization. "Civilization that makes you suffer. Barbarism which is to me rejuvenation," he wrote (1891) to the Swedish playwright August Strindberg. So Gauguin installed himself in Brittany (Pont-Aven and Le Pouldu, 1889-90, 1894), Tahiti (1891-93, 1895-1901), and the Marquesas Islands (1901-03), where he could paint scenes of "natural" men and women. Before 1891, Gauguin tended to flatten things deliberately, and his effect was often strained, but throughout the 1890s his primitivism became less aggressive as the influences of J.-A.-D. Ingres and Puvis de Chavannes led to increasingly rounded and modeled forms and a more sinuous line. This process can be followed in works such as "Nafea Faa Ipoipo" (1892; "When Shall We Be Married? "), "Nave Nave Mahana" (1896; "Holiday"), and "Golden Bodies" (1901). Simultaneously, Gauguin's images became more luxuriant and more naturally poetic as he developed his marvellously orchestrated tonal harmonies. His chief Tahitian work--"Where Do We Come From? What Are We? Where Are We Going?" --is an immense canvas painted in 1897-98. This is the consummate expression of much that he had painted in the previous six years, and the aura of dreamlike, poetic inconsequence which surrounds this semiphilosophical allegory of primitive life is most powerful. From 1899 on, Gauguin became increasingly ill and was continually in pain; he was also involved in frequent rows with the governing authorities for siding with the natives against them. Yet despite melancholy, his last pictures still have serenity and hope. In 1889-90 a group of young followers had gathered round him at Pont-Aven, including Sérusier, Charles Filiger, and Denis, who transmitted Gauguin's ideas to Édouard Vuillard and Pierre Bonnard. The Norwegian painter Edvard Munch owed much to Gauguin, as did the painters of the Fauve group--Henri Matisse in particular--who profited from his use of colour. Gauguin's primitivism and stylistic simplifications greatly affected the young Pablo Picasso and led to the aesthetic appreciation of black African art and hence to the evolution of Cubism. In Germany, too, Gauguin's influence was strong. Gauguin was unique in his ability to hold a mysterious balance between idea, perception, and visual image. His pictures make their effect visually, not as a result of literary overtones. He was a great stylistic innovator, and, when he rejected the conception of a picture as a mirror image of an actual scene and turned from an empirical to a conceptual method of pictorial representation, his influence was wide and long-ranging. Oil on canvas 28 3/4 x 36 1/2 in. Private collection Form: This oil on canvas painting exhibits intense, saturated, non-local colors. Gauguin’s paint quality is spotty and thin and in general his brushstrokes are not as thought out or visible as Van Gogh's. 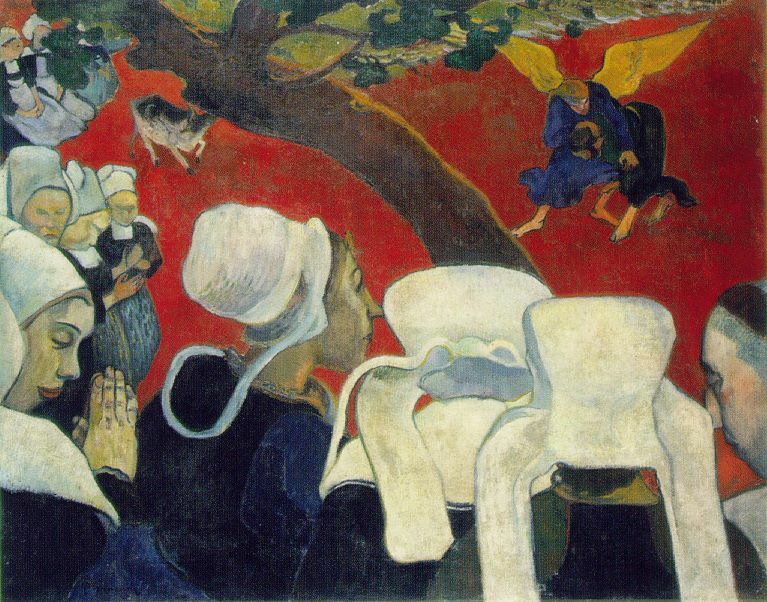 Gauguin’s work is not really about an illusionistic tradition. The forms are often very flat and almost feel as if they are forms cut out of colored paper. Gauguin doesn't concern himself much with chiaroscuro, value or perspective in most of his paintings. Iconography: Gauguin was a friend of Van Gogh, and the two often painted each other. This paining is showing Van Gogh in the process of creating the work for which he is most famous for, Sunflowers, and shows him with his characteristic bright red beard. Context: Gauguin was married and had five children, he became unemployed when the bank he was working for went through some financial difficulties. Free to pursue his dream of painting full time he moved to Arles, where the living was cheaper, and there struck up a friendship with Van Gogh. He also went to Denmark, but then disappointed at not being able to sell his paintings, came back to France and lived at Pont-Aven, before embarking off to Tahiti. Jacob and Angel c525CE Form: Oil on canvas, red is the primary color used for the ground, instead of the expected green, and everything is pushed forward and crowded into the picture plane. Space and the illusion of space is basically ignored except for in the size scale relationship of the figures in the foreground compared to the wrestling angel in the background. 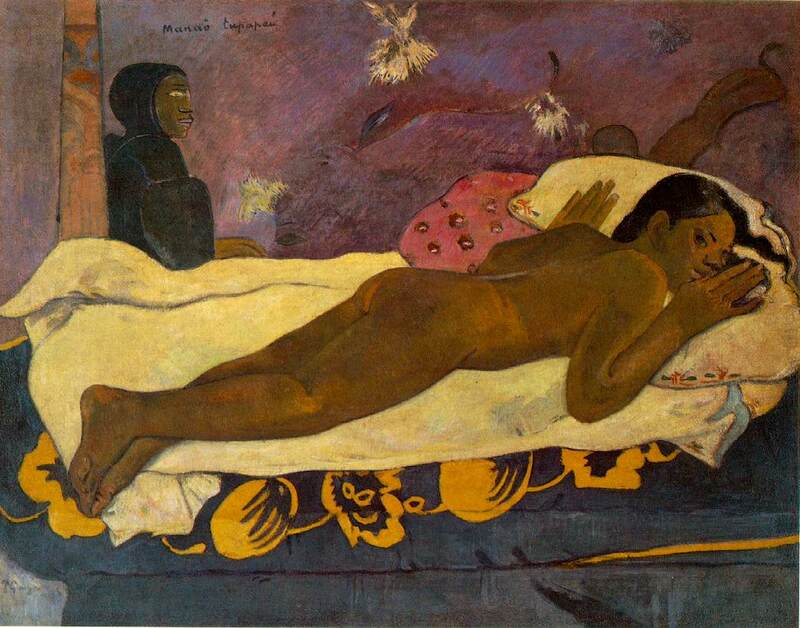 Iconography: Gauguin painted this work while living in the small town of Arles. There was a small community of devoutly religious people whom lived there and he was so impressed with their almost fanatical belief that he painted this as a representation of some of the women having a vision of Jacob wrestling with the angel. Jacob stole his brothers' birthright, and Esau, his brother went out to kill him. Jacob hid out for 20 years, built up great wealth and family, and decided to make it all up to his brother. He sent many gifts to him before he journeyed forth to find him, and while on the road ran into what is interpreted to be an angel. He wrestled with the angel, was wounded in the process, but won, and was renamed Israel. He was given the angels blessing and all turned out okay in the end. It has been speculated, because the Bible does not truly make clear who exactly the person was in the road, that it could be an allegory for Jacob wrestling with his conscience, guilt, or with God. Context: If we are to assume that Gauguin was trying to say anything about his respect for these women and their devotion, it could have been that he was feeling guilt for having left his wife and five children behind while he pursued his dream of painting. 1891 Oil on canvas 44 3/4 x 34 1/2 in. Metropolitan Museum of Art, New York Form: Oil on canvas, a bit of a departure from the early impressionist style Gauguin had adopted while painting with Van Gogh. There is still much non-local color in the skin tones, and perhaps because of the religious name of the painting, his adopted style is somewhat flat and Byzantine. Iconography: Gauguin, tired of being a failure in France, eventually moved to Tahiti to live permanently. He became enthralled with the locals, their lifestyle seemed to encompass the bohemian and religious ideals that he had been unable to attain. That is, walking around in states of what he would consider 'undress', the slow pace of the island, and that he was respected as a painter by the locals. He was just as exotic to him as they were to him. Because of his overwhelming adoration for this lifestyle, he began to paint the people around him as religious icons, in this case the Virgin and Child. Interestingly, his paintings sold better in France now that he did not live or paint there. 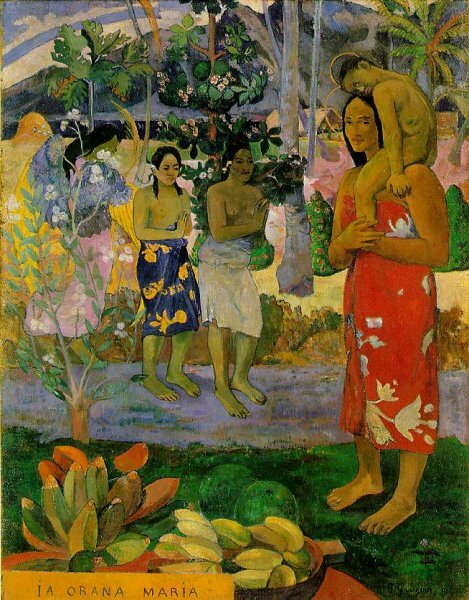 Context: By now, Gauguin had left his wife and children for good and had very little contact with them. Albright-Knox Art Gallery, Buffalo, NY Form: Oil painting with a markedly more subdued palette, and an almost cubist feel to it. Note that he way the girl is tilted off the bed is reminiscent of a Cézanne still life. Iconography: Gauguin was a scalawag of the highest order. With five children and a wife in France he found himself a thirteen-year-old girl as a lover. This is a portrait he painted of her in their shared bungalow. The story has it that she would wake up screaming from nightmares, knowing that her relationship with Gauguin was wrong, and pronounce that the spirits of her dead ancestors were watching them as they slept and disapproved greatly. This painting also follows in the tradition of French artists like Ingres and Manet, where the painting is all about the male gaze and the naked female form. It also recalls the idea of Orientalism, 'exotic' things and people in 'exotic' places. Context: Though Gauguin may have decided to adopt the island life, he could not seem to leave behind his Eurocentrism and style of panting. He may have felt that he was being terribly creative, but in truth he was merely recycling the same themes and settings that have been passed down through all European Art Academies. Oil on panel 9 1/2 x 6 in. The Fine Arts Museums of San Francisco Form: Form: Seurat's style is called "pointalism" because Seurat painted by putting dots of pure color one next to the other. When the viewer moves away from the painting the dots are mixed together by our eyes. This optical mixing is very similar to what happens with the individual pixels on the computer. Seurat's color were often the most pure and saturated hues available and in order to modulate the colors he would often place a dot of a complimentary color next to another in order to desaturate the colors. Often he would place two primary colors next to another in order to creat a secondary color. By placing a blue dot next to a yellow one he could create a green field. Make sure you click the picture to get a close up view of it. 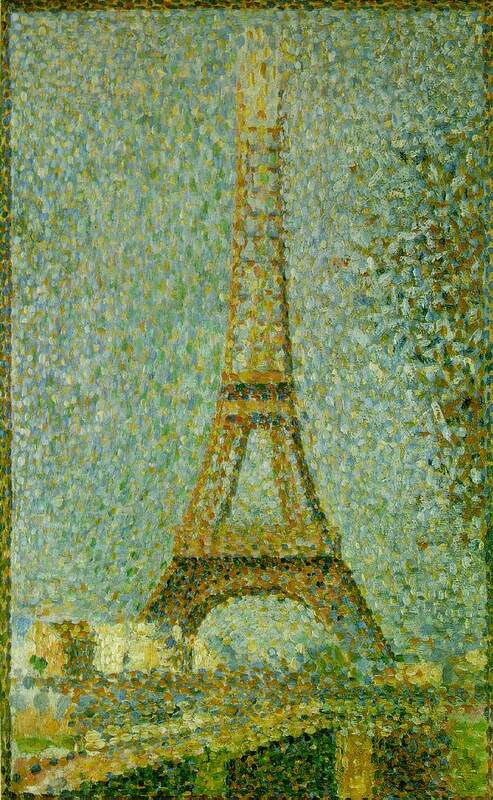 Iconography: The Eiffel tower is a much better subject than people for Seurat, especially because of his 'scientific' and analytical view of painting. because of the cooler colors used for the sky, and the warmer colors used for the tower, he was able to create a definition between the man made building and nature. It also worked to create a sense of atmospheric perspective, as though we are seeing the tower through the fog of early morning. Context: Seurat was a native of France, so the Eiffel tower was a fairly common and familiar sight for him. The "scientific" painter with his abstruse color theories recedes somewhat, and an inspired lyricist comes to the fore--a 19th century Giorgione. As the art historian Robert L. Herbert puts it in his catalog essay, Seurat "wanted to be perceived as a technician of art, and so he borrowed from science some of the signs of its authority, including regularity and clarity of pattern. "But, as Herbert points out, Seurat's dots are not really dots either. Far from laboring away at a mechanical surface programmed in advance by theories of complementary color, Seurat displayed the most intuitive and mobile sense of the relations between sight and mark. One of the miracles of his art is his ability to analyze light, not through the simple juxtaposition of dabs of color but by a layering of tiny brush marks built up from the underpainted ground, so that the eventual surface becomes a fine-grained pelt, seamless and yet infinitely nuanced, from which captured light slowly radiates. 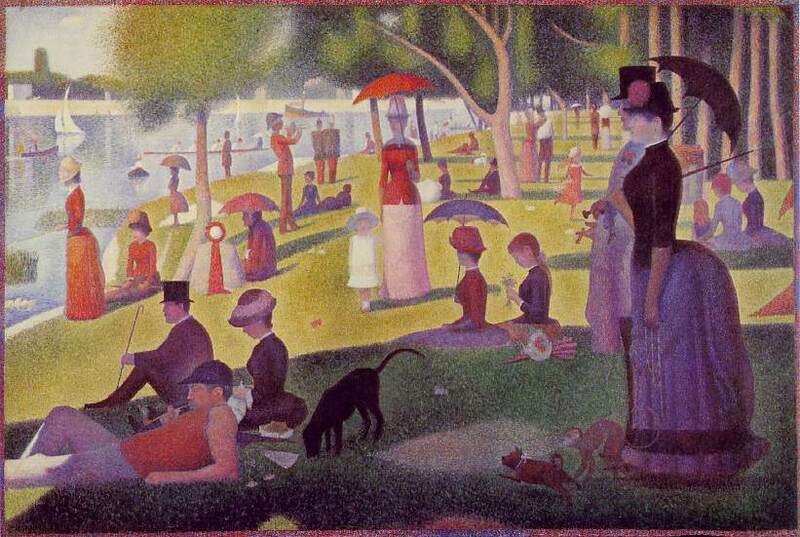 Iconography: Seurat was disdainful of the practice of Sunday afternoon strolls in the park, as they were covers for peoples' naughtiness. Much like an 'afternoon delight', the park was where married men would go to dally with their mistresses, unemployed men would lay on the grass and smoke, and women would bring their unruly children to run rampant. If you look at the right side of the painting, you will see the woman with the umbrella walking with the man. She has a pet monkey on a leash and there is a dog frolicking near it. The woman is the mistress, the monkey is a symbol of an 'exotic pet', which the woman would herself be considered to be, and the dog is a symbol for fidelity, of which the man seems to have none of. "Seurat spent two years painting this picture, concentrating painstakingly on the landscape of the park before focusing on the people; always their shapes, never their personalities. Individuals did not interest him, only their formal elegance. There is no untidiness in Seurat; all is beautifully balanced. The park was quite a noisy place: a man blows his bugle, children run around, there are dogs. Yet the impression we receive is of silence, of control, of nothing disordered. I think it is this that makes La Grande Jatte so moving to us who live in such a disordered world: Seurat's control. There is an intellectual clarity here that sets him free to paint this small park with astonishing poetry. Even if the people in the park are pairs or groups, they still seem alone in their concision of form - alone but not lonely. No figure encroaches on another's space: all coexist in peace. "This is a world both real and unreal - a sacred world. We are often harried by life's pressures and its speed, and many of us think at times: Stop the world, I want to get off! In this painting, Seurat has "stopped the world," and it reveals itself as beautiful, sunlit, and silent - it is Seurat's world, from which we would never want to get off."